Emma Kang is a registered dietitian who has worked in nutrition since 1999. With a Master of Science in nutrition, she specializes in weight management, diabetes and women's health. Kang has worked as the editor for a diabetes website and has published several books and articles on nutrition and diabetes. Omega-3 supplements are the most commonly used natural product taken by adults, outside of vitamins and minerals, according to a 2007 survey by the National Center for Complementary and Alternative Medicine and the National Center for Health Statistics. They offer a number of potential health benefits, such as protection against heart disease, reduced inflammation of rheumatoid arthritis and improvement in mood. Along with adequate protein intake, omega-3s may help reduce hair loss, but you should consult your doctor before starting any new supplementation regimen. The Hair Loss Learning Center reports that hair loss affects about 35 million men and 21 million women in the United States. Some hair loss is normal -- you naturally lose several dozen hair strands per day -- but excessive hair loss, or loss not replaced with new hair growth, leads to hair thinning and baldness. About 40 percent of men have noticeable hair loss by age 35 and 65 percent by age 60. Although many forms of hair loss are due to genetics or emotional stress, hair loss due to poor diet is often reversible. Lack of omega-3 fatty acids in diets is a common cause for nutritional deficiency related hair loss, as stated by the University of Maryland Medical Center. Treatment often involves adding 1 to 2 capsules or 1 tablespoon of fish oil daily to encourage hair growth, decrease inflammation and reduce dry flaky scalp. This dosage recommendation is equivalent to consuming 2.5 grams of omega-3. Alternatively, you can include omega-3 rich foods in your diet. For example, 3 ounces of cooked salmon contain 1.8 grams of DHA and EPA, and 1 ounce of walnuts and flaxseeds contains between 1 and 2 grams of ALA. The American Heart Association recommends eating 6 ounces of fish two times a week to achieve a beneficial effect of omega-3. High dosages -- more than 4000 milligrams -- may increase risks of bleeding. These risks are higher if you take medication that affects the thickness of your blood, such as the blood thinner warfarin, because the omega-3 fatty acids can affect the efficacy of these pharmaceuticals. 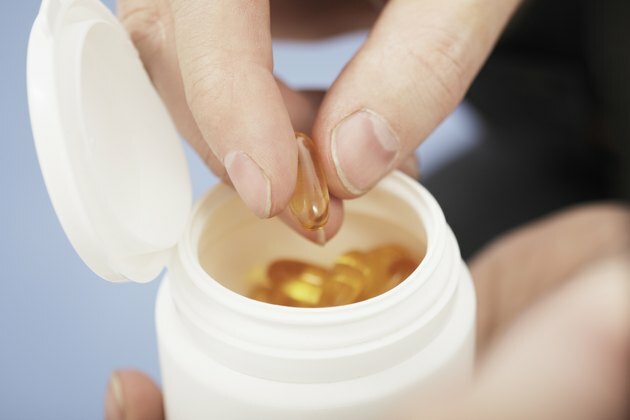 Make sure you consult your doctor before you start taking omega-3 fatty acids, and only take them at the dosage level recommended by your physician.